There is no logical explanation why the thought of frying catfish makes me feel like I’ve just stepped onto the set of an old TV show about a hillbilly family that moved to Beverly Hills – go figure. I liked the show. Although I don’t remember Granny “fryin up a mess o’ catfish”, she probably did. 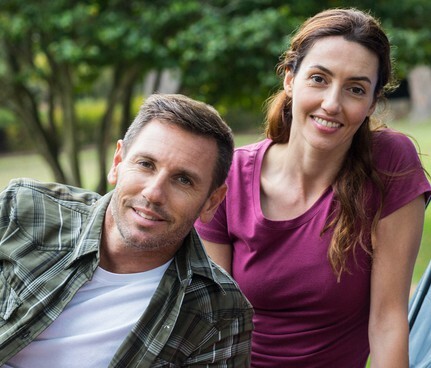 I grew up in the Midwestern part of America, close to the convergence of the Mississippi and Missouri Rivers, so catfish was readily available in our area. During the summers, my parents often got us up very early for a Saturday morning fishing trip. They almost always came home with a few catfish. Occasionally, one or two stubborn fish were determined to remain alive, perhaps plotting their escape options. They were even given a bit of a reprieve – a few more hours of life in the bathtub. And to their surprise a couple of little children to pet them. However, we knew we only had them to play with for a few hours. Soon, their ‘time’ would come – or dinner time would soon come upon us. We suffered no sadness because we were aware that they were for our nourishment. During the school year, our fish came from a little shop that was situated on the banks of the Missouri River. My mother put in her order in early September and it was always ready for her to collect every Friday afternoon. There is something about frying catfish that reminds me of home and family. Those meals were when we spent a lot of quality time together. When I was younger, I could help by coating the fish with flour and spices and also making some of the side dishes. As a teenager, there were more side dishes to prepare, but I also began to learn how to fry the catfish. This was a good opportunity for my parents to explain how the fish should look and what the proper shade of golden brown was for a good piece of catfish. I had to learn to pay attention and try not to get popped by the hot grease. But most of all, I had to learn how to stand at the stove and wait for my food to finish cooking. CHEF TIP #1: Lay a dry towel down on a baking sheet and place the fish pieces on the towel. Take a second towel and lay that on top. Go around each piece and pat it dry. 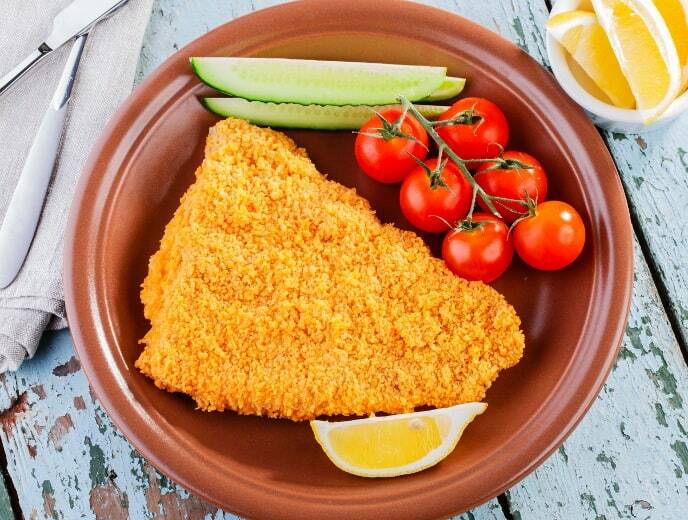 If the fish is too wet when it goes into the flour mixture, the coating on the fish will be too clumpy and when it’s fried it may be too soggy or chewy. There are many different spices, seasonings and other ingredients you can use when creating your batter. You can try a ‘fish and chips style’ batter for a texture that will be light and crispy. Try mixing a strong beer with the dry ingredients; it can greatly add to the flavor of the batter. You can also see how a Parmesan cheese and bread crumb dry mix will work with your batter. These two items along with an egg white wash will cause your batter to be crunchy outside yet will leave the fish flaky and tender on the inside. Adding a handful of dill to a batter mixture is also a great idea. CHEF TIP #2: There are two ways to test the oil to make sure it’s hot enough for frying. The first is that you can sprinkle a small pinch of the flour mixture into the oil. If it begins to sizzle, the oil is ready for the fish. Secondly, you should be able to see the smoke rising from the oil when it has reached the proper temperature. After a few fish fries, you might even come up with your family’s trademark catfish batter. It could be the one to use if you enter a local fish fry competition. To keep the oil temperature close to 350F – 375F, fry only two or three pieces of fish at a time. Each piece that goes into the oil drops the temperature. Too many pieces of fish will keep the oil from quickly reheating. Cool oil produces greasy fish and that adds calories so let a minute or so lapse between frying batches. This will allow the oil to reheat. Test it again with a pinch of seasoning, or use a cooking thermometer, if you have one. Be careful that you don’t overcook batter-coated fish. When it turns a nice golden brown, your fish is done. It can change for golden to dark brown very fast and when it does, the batter could be burned which gives it a bitter taste. When you remove it from the oil, give the fish a few minutes to drain. Place the pieces on top of a wire rack that has been set over a shallow pan or baking sheet. If you don’t have a wire rack, place the fish on a plate that has at least 2 or 3 papers towels on it. They will soak up a lot of the oil. If you are cooking for a large number of people, set the rack or oven-safe plate in a preheated oven on a low setting of 200F to keep it warm. The other option is to let people start eating the side dishes and serve the fish in batches as soon as it’s ready. 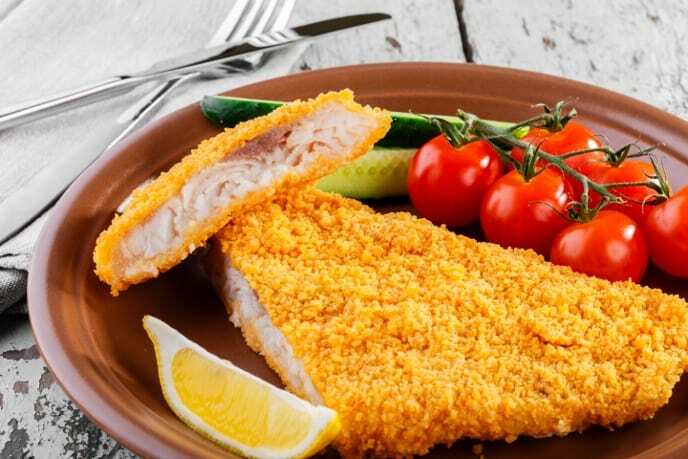 Here is the recipe for a very traditional Southern Fried Catfish. It’s the kind of catfish southerners have enjoyed for years and still enjoy today. Any day is the perfect time for you to fry up a mess* of catfish for dinner. 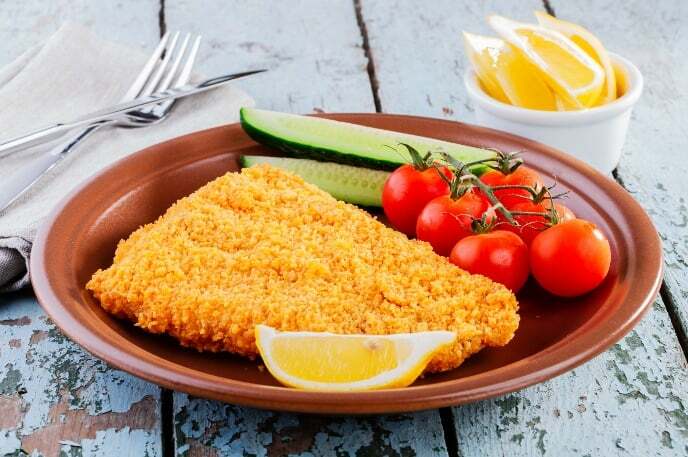 Simple but delicious southern fried catfish recipe. In a large heavy-bottomed pot, like a Dutch oven, pour in 2 inches of cooking. Let the temperature rise to 350 degrees over a medium-high heat. While the oil is heating up, whisk the buttermilk and hot sauce together in a large bowl. Place the catfish fillets in the bowl and let them soak for 15 minutes. As the oil is heating up and the fish are soaking up the liquid, combine the flour, cornmeal, Old Bay seasoning and 2 Tablespoons of salt in a large bowl. Take the catfish out of the buttermilk mixture and allow any excess liquid to drain off. Next, add the catfish fillets to the flour mixture. Coat each piece thoroughly on all sides, tapping off any excess flour. Transfer the fillets to a plate. Very carefully set 2 or 3 fillets at a time into the hot oil and let them fry. When the fish is cooked through, the breading will be crispy. This should take between 7 and 8 minutes. Transfer these fillets to a plate lined with a couple of paper towels. Add another 2 or 3 fillets and season the cooked pieces with salt. Serve them while they're hot.